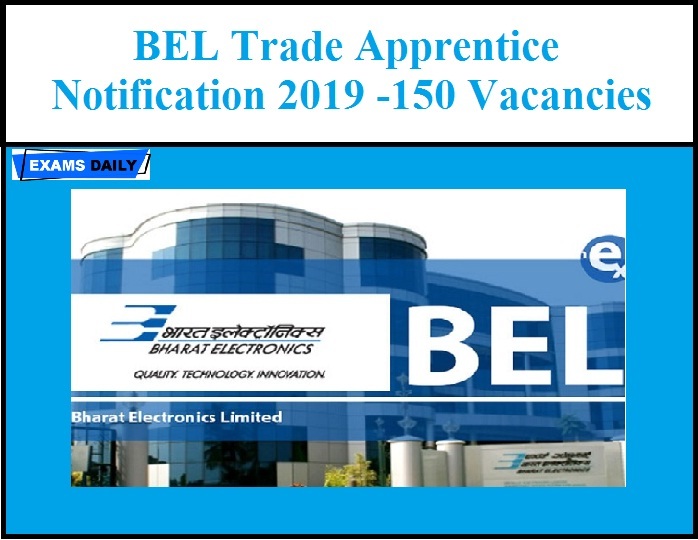 Bharat Electronics Limited (BEL) has released Notification for the post of 150 Trade Apprentice. Application are invited from eligible candidates. Candidates can apply though Online on or before 22-04-2019. Age Limit: Candidates age should be Maximum 28 years as on 30.04.2019. For Age relaxation is applicable as per rules. Education Qualification: Candidates should have ITI Training under NCVT only with at least 60% marks for General and OBC Candidates and at least 50% marks for SC, ST& PWD candidates, from recognized ITI’s. Selection Procedure : Selection will be based on Written Test/Interview. How to Apply: Candidates can apply online through the website: http://www.apprenticeship.gov.in on or before 22-04-2019.